Mon., Nov. 15, 2010, 3:44 p.m.
Paul Dunham, the subject of a Spokesman-Review story Friday on the deeply held desire of many seniors to grow old in their own homes, died Monday. 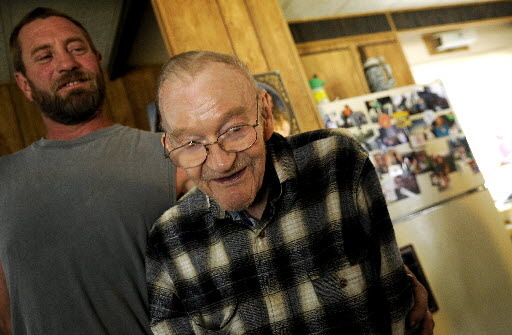 Dunham had lived in his Hayden mobile home with Nancy, his wife of 60 years, until Thursday when his health deteriorated and he needed constant care. At that point, his family moved him to the nearby home of his daughter, Kristi Taylor. Dunham was 83 and had suffered from a neuromuscular disorder that diminished his body to 83 pounds over the course of two decades. He also was diabetic and had prostate cancer. Taylor said her father retained his characteristic good humor and positive attitude up until he slipped into a coma on Saturday. “He was cracking jokes,” she said. Dunham was born Oct. 8, 1927, in Erie, Penn., where he met and married Nancy in May 1950. The couple had three children, seven grandchildren and 11 great-grandchildren. The Dunhams moved to Florida in 1951, where Paul Dunham loved to fish the Keys. They moved to Republic about 20 years later, drawn, Nancy Dunham said, by inexpensive land. They lived there 10 years before moving to Spokane. In 1990, they moved to the mobile home park in Hayden. They were able to remain in their home, with the assistance of a 25-hour-a-week caregiver, due to a Medicaid program that provides in-home care in lieu of nursing-home care. The story highlighted the nationwide growth of health care options that allow people to receive caregiver assistance at home instead of moving to nursing homes. Though his condition sapped his body of strength, Paul Dunham’s mind remained sharp and, until recently, he continued to pay his own bills and balance his checkbook to the penny. As his strength deteriorated, Dunham constantly found new ways to perform basic daily tasks, always advocating for doing what he had to do to get by. Published: Nov. 15, 2010, 3:44 p.m.